What a great start! The SME Assembly 2016 is now well under way after kicking off yesterday on Wednesday 23 November in Bratislava, Slovakia. The day was full of events including business tours, the SME Week Reception and the Schumpeter Lecture to name a few. Missed out or couldn’t attend all sessions? Don’t worry here is a quick round up of yesterday’s highlights. It all started bright and early with the first business tour of the day to go and see none other than Slovakia’s flying car! Yes you read that correctly, the entrepreneurs behind this automotive innovation showed delegates the product of their efforts, a flying car that makes use of existing aviation and automobile infrastructure to offer a future with the possibility of real door-to-door travel. The second business tour took delegates to GA drilling. This innovative SME in the drilling sector is working towards revolutionising current drilling technology to allow for cheaper and more efficient drilling, with the idea of providing affordable and sustainable geothermal power to all. Delegates were treated to a very interactive demonstration of the unique plasmabit technology that is currently under development. 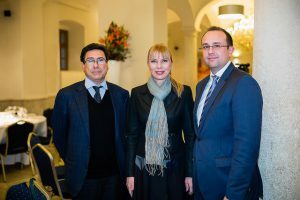 There was little time to rest as the next events got underway, with the SME Week Reception starting first in the Old Market Hall where the guests were welcomed by State Secretary of the Slovak Republic Rastislav Chovanec. The reception was full of fun as national winners, exhibitioners and other attendees had the chance to meet, network and socialise. The Committee of the Regions introduced the 2018 EER Awards, and a regional polish project, Selvita (a drug research company) was also given the floor. Along with all these introductions, guests were treated to a taster of what is to come in the following days of the SME Assembly. To finish off an amazing first day with the presence of Commissioner Elżbieta Bieńkowská over dinner at the Restauracia Hrad, a small group of delegates was invited to the Schumpeter Lecture. Special guest speaker Philippe Aghion from Harvard University delivered a captivating lecture. 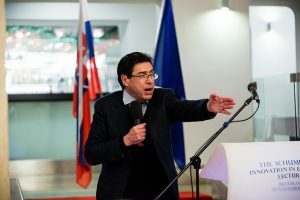 Professor Aghion addressed the trials of promoting innovation in Europe and the need for Europe to adapt and reform, saying that ‘If we want to revive the idea of Europe, we have to deliver abroad’, when speaking of Europe’s performance on the global market. SME Assembly 2016 – The delegate verdict is here! SME Assembly 2016 – Get ready for Wednesday!